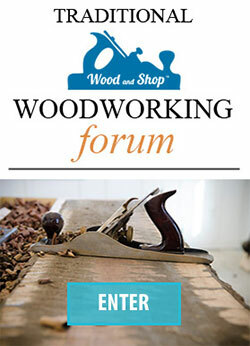 Having sharp hand tools is one of the absolutely most important aspects of traditional hand tool woodworking. But it can also be a real challenge, and often takes several years to really figure out the sharpening methods that you like best. There are so many ways to accomplish the same result. When I first got started in traditional woodworking I made the mistake of trying to buy the cheapest sharpening supplies, and I had to repurchase a lot of supplies. So below I’m going to tell you what you should buy and what you shouldn’t buy. I implore you to trust me. 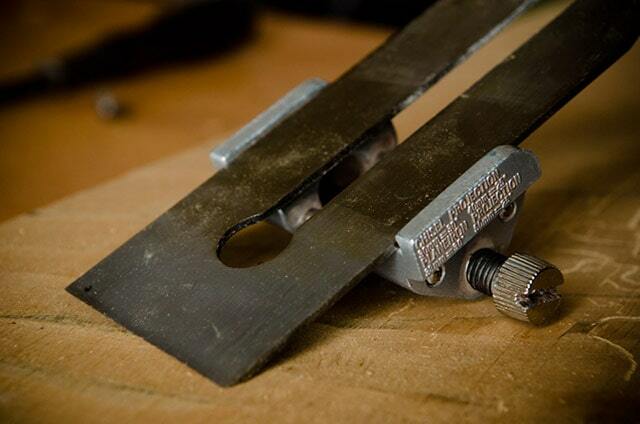 Spend a little more money to buy the right sharpening tools upfront…you’ll save money this way. Having sharp tools is usually more important than having amazing tools. I’d rather cut a board with a razor sharp bad saw than with a dull (or poorly sharpened) good saw. 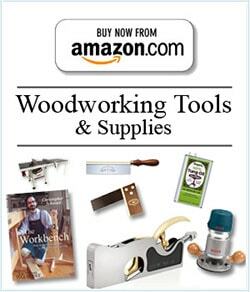 Ideally you can have great tools that are sharpened properly. Below is a summary of the basic steps of sharpening edge tools and hand saws. This page won’t go into details on how to sharpen..refer to my hand tool sharpening page for sharpening tutorials. The first part of sharpening edge tools (e.g. chisels & plane irons) is flattening the back so it will lead to an invisible (and sharp) edge. 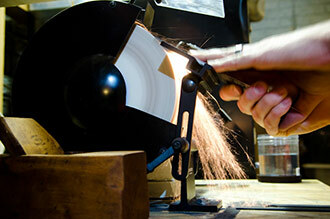 Lapping can be done on diamond plates, sandpaper, a belt sander, water stones, oil stones, etc. The key is to move from progressively course media to fine, so you end up with a polished back. The entire back of an edge tool need not be polished, but just the first inch or so. 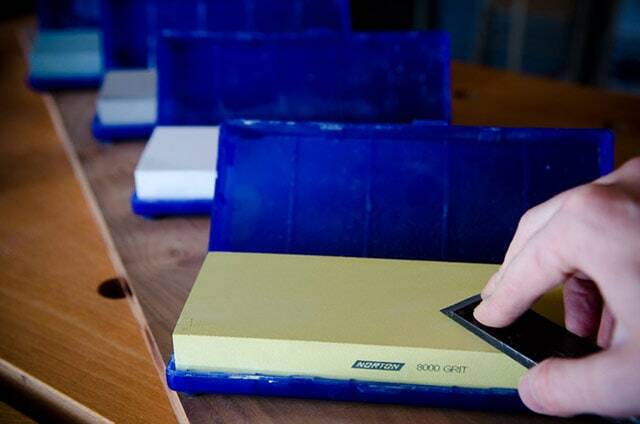 After lapping/flattening the back, next comes the establishment of the bevel with a grinder, sandpaper, or other sharpening systems like the Work Sharp sandpaper sharpener or a wet grinding system (like these). 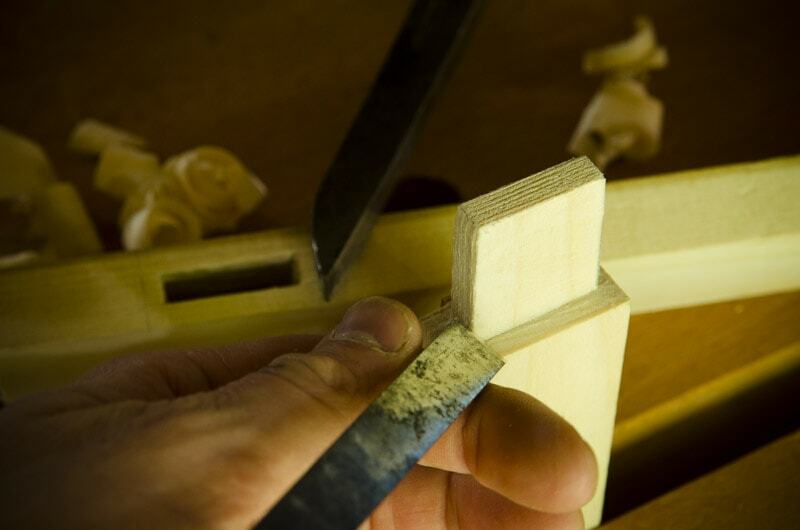 The last step, after establishing the desired bevel angle, is to refine the edge with progressively finer waterstones or oil stones, until the edge disappears and the intersection between the back and bevel is razor sharp. 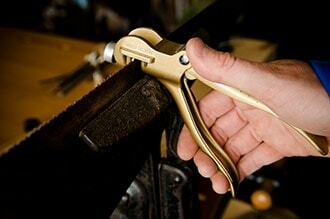 An optional step after honing is “stropping” with fine stropping compound on leather. The first part of sharpening hand saws is to use a file to level the tops of the handsaw teeth so they are all the same height. 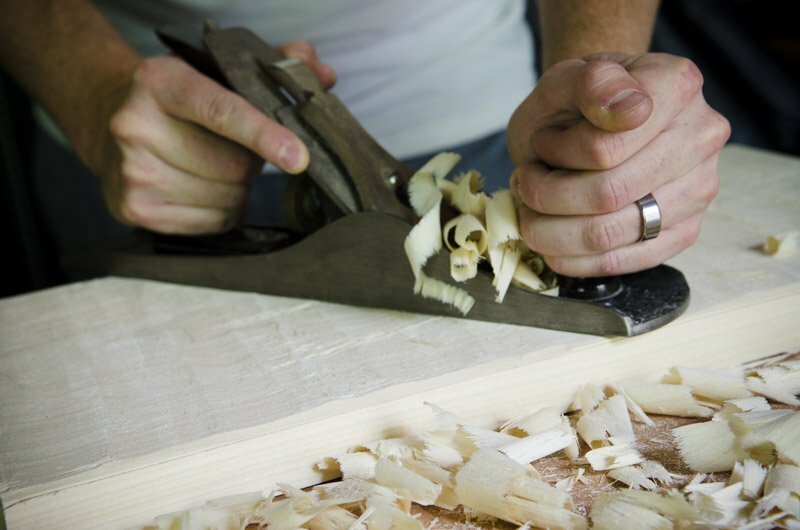 This step doesn’t have to be done every time someone sharpens their handsaws, but just when the saw is sharpened for the first time or after the teeth have become damaged or overused. 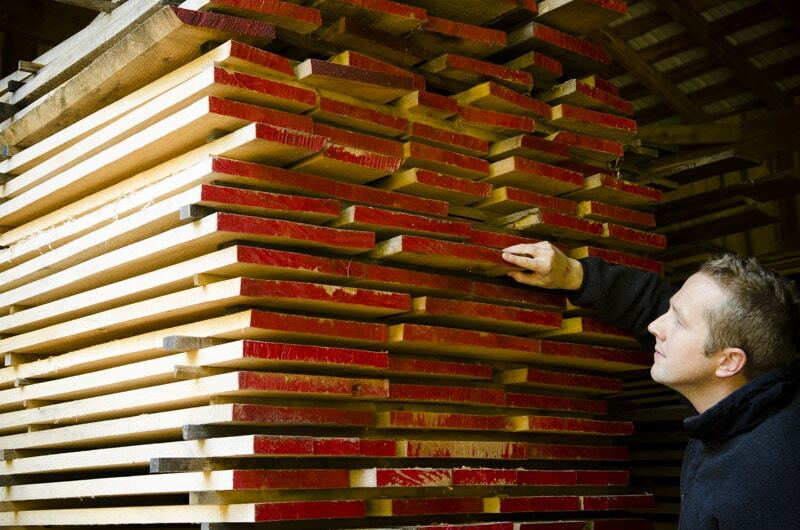 After jointing the tops of the teeth, a woodworker shapes the tooth angles with appropriately sized triangular files. Rip teeth and Cross-cut teeth are sharpened at different angles, and more about tooth shape and tooth points can be learned in my handsaw buying guide (here). After the saw teeth are shaped, a woodworker uses a special tool to set spread the teeth apart slightly so the teeth won’t bind up in cutting the saw kerf. Different uses of a handsaw and different tooth size require different amounts of set. Personal preference is also a determining factor in the amount of set on saw teeth. Below are my recommendation for types & brands of sharpening tools that you will likely need right at the start of your traditional woodworking sharpening. If you’re on a really tight budget, don’t fret. 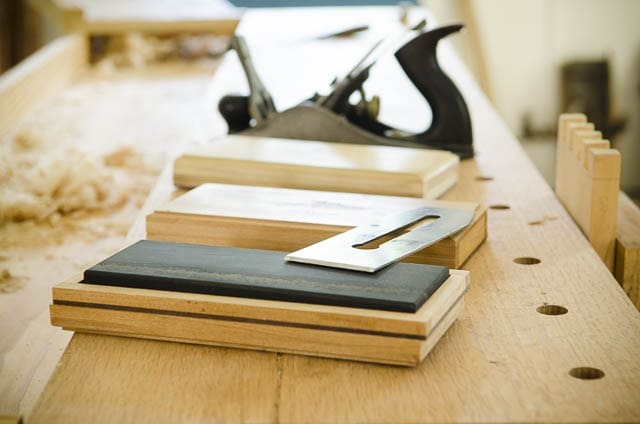 You can use your judgement to narrow down this list and make due without everything at first…but just make sure that you buy fewer tools at first, rather than lower quality tools. I guarantee that you’ll have to buy a better replacement down the road. 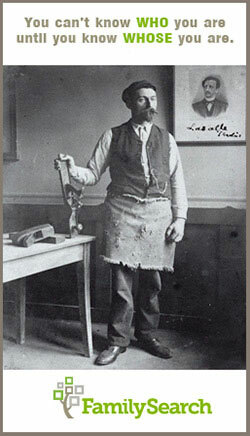 But you can often find the highest quality antique tools for less money than poor quality new tools. 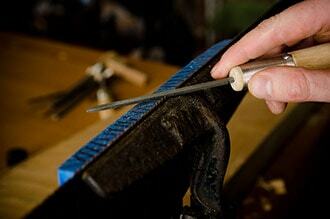 Let me first say that there are many methods for getting a keen edge on chisels & plane irons. 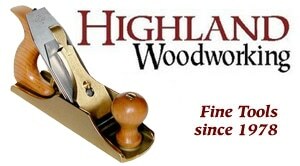 You can see my page on learning how to sharpen your hand tools here. I spent a lot of time and money trying to find the system that works best for me. My system involves obtaining a primary angle on a grinder, then honing the angles on waterstones. 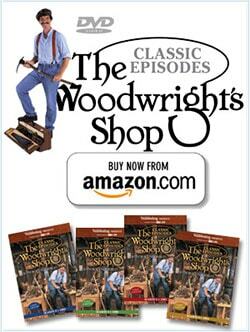 This system is also used by the majority of other traditional woodworkers. Sandpaper sharpening works, but is more expensive in the long run. Huge sharpening machines (like this) are really slow & expensive. So I stick with a fairly traditional method. 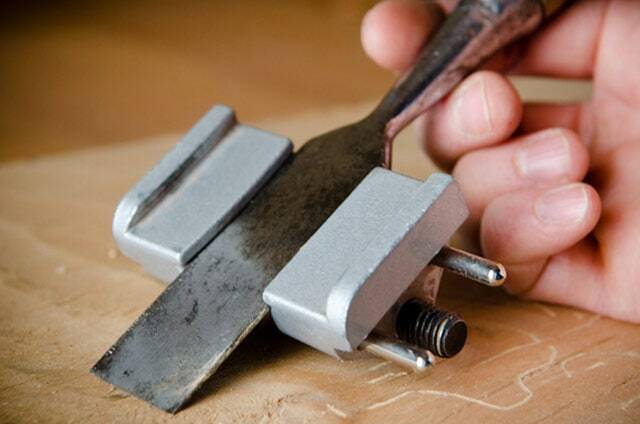 A grinder is my favorite method for quickly establishing the correct angle on chisels and plane irons (blades). My simple sharpening process starts out on a slow speed bench grinder with special wheels (like white aluminum oxide wheels) that don’t heat up as much as traditional grinder wheels. However, you can overheat the edge of your chisels and handplane irons even with these special wheels. Regularly quenching your hot edge tool in water or peanut oil is essential. You can even grind your edge tools on a cheap normal wheel as long as you quence often enough. Slow speed grinders and cooling wheels just require less quenching. Here are some good 8-inch slow speed bench grinders. If you already have a normal bench grinder, you can buy aluminum oxide grinder wheels for it right here. I prefer a finer grit wheel, like 80-150 grit. 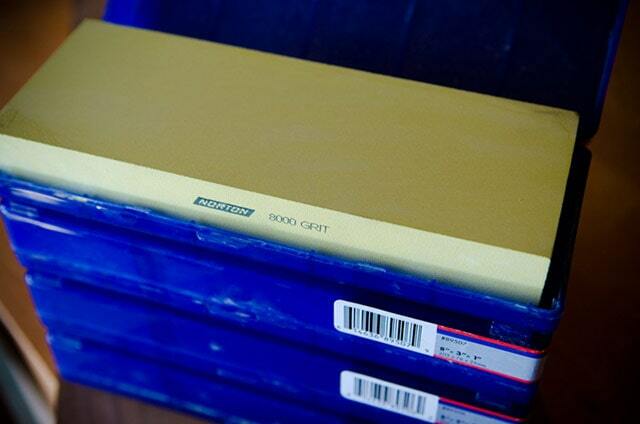 Perhaps the best wheels for cool grinding are these 80 grit Norton blue grinding wheels. Vintage hand crank grinders (like these vintage grinders on ebay) are also fantastic and extremely affordable & safe. You just need to learn how to crank & sharpen at the same time…or get your kids to do it for you! Again, just buy a new grinding wheel for it, if needed. 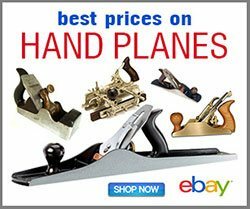 Here and here you’ll find some good articles on choosing antique hand crank grinders. The tool rests that come with grinders are not ideal, but over time you can learn to grind free hand with them. I however, take them off. 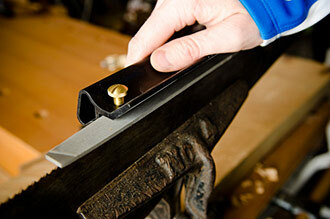 I recommend that you buy the Veritas Grinder Tool Rest (pictured above). It’s the tool rest that was most people recommended to me, and I’ve really enjoyed my set. The angle is simple to adjust. You can purchase it here. The Vertitas Grinding Jig (sold separately) leaves a bit to be desired, but maybe I just haven’t figured it out yet? Just learn to grind freehand like your ancestors! I use my grinder all the time, and the wheel occasionally needs to be “dressed”. This means flattened with something harder than the wheel. I use a wheel dresser to accomplish this. I purchased this inexpensive dresser on Amazon and it has worked just fine. Over the years I have spent a lot of time researching and testing different sharpening & honing methods, and have altered and changed my methods several times. 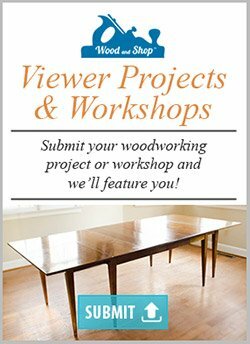 I have finally come up with a honing system that works well for traditional woodworkers. There are many debates over the pros and cons of water stones vs. oil stones, but both of them essentially do the same thing. For several years I used only water stones for honing because they cut metal faster and let me sharpen more tools in less time. But I found it very inconvenient to have to haul my dull edge tools and sharpening equipment to a sink in my house and put on a huge production every time I wanted to hone my dull tools. Then I had to be very conscious about quickly drying and oiling all the metal before rust sets in, and had to flatten the stones each time I used them. I ended up honing less often and using semi-sharp tools, or just putting them in a box to hone later and use a different tool. Moving up from 220 grit (lapping & minor grinding) all the way to an 8,000 grit polishing stone will give you a perfectly honed edge. They are wide enough for any hand plane iron/blade. And these 1″ thick stones will last you for years (the 8,000 grit will likely last you for the rest of your life) so don’t cringe at the high prices. Or you can just buy cheap junky sharpening stones and get so frustrated that you eventually buy these waterstones. It’s your choice. If you’re on a tight budget, Norton also sells two-sided stones (like this), although the honing process will take a bit longer. A word of warning: don’t by cheap waterstones, like this terrible double-sided $47 waterstone. I decided to test it out to see if I could recommend a more affordable stone, but discovered that it didn’t really have a 6,000 grit side at all…just a thin 6000 grit veneer that wore away after several honings. 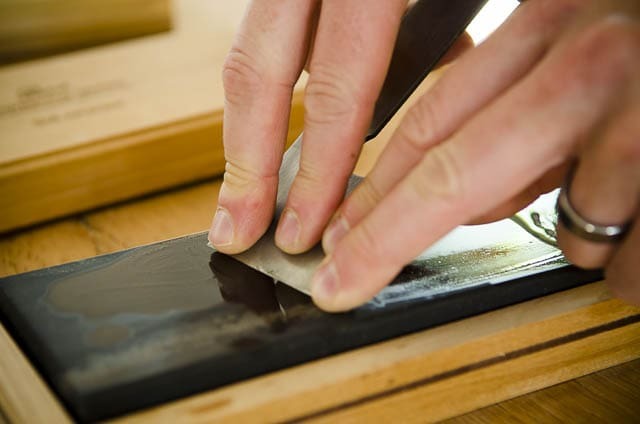 Please trust me when I tell you that having nice honing stones, like those mentioned above, will save you hours of frustration and will make sharpening enjoyable (instead of a chore). 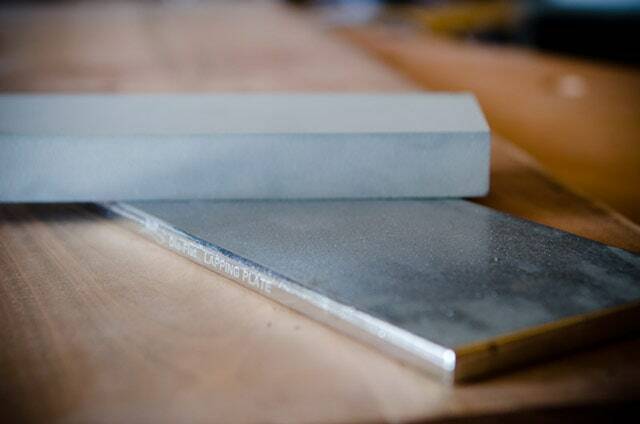 Oil sharpening stones are natural stones that are quarried and cut to size. The most common types of oil stones are India Oil Stones and Arkansas Oil Stones. 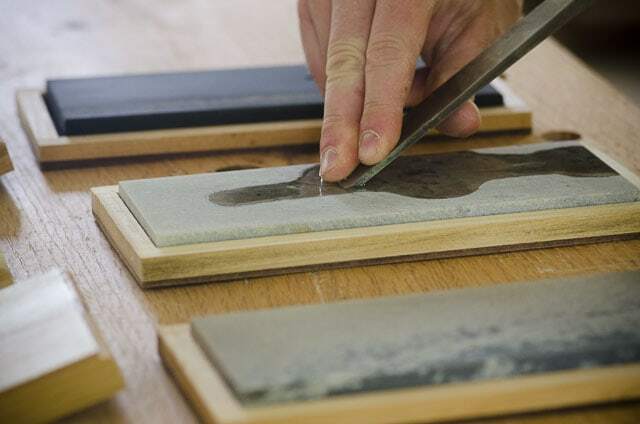 After talking extensively with oil stone experts, I can recommend that Arkansas stones are the most durable oil sharpening stones, and will give you the best, and sharpest results. But, as some well-known woodworkers have recommended (they shall remain nameless), you don’t need the very expensive “translucent” stone. The grit difference between the black surgical stone and translucent isn’t very big. This will save you some good money right here. Even the seller of the stones that I purchased said that a translucent stone won’t give a noticeably sharper edge than the black arkansas. The fragile translucent stones are so expensive because they are difficult to find in large pieces in the quarries, not because they are so much more useful. So I recommend a three oil stone kit in the 8-inch x 3-inch size: (a) Soft Arkansas (courser grit), (b) Hard Arkansas (medium grit), and (c) Black Arkansas (fine grit). Here are the oil stones that I own, from the Best Sharpening Stones company. Moving through these three grits is good enough for surgical instruments, so it will be just fine for your chisels and handplanes. I chose this particular set because the stones are wide enough (3-inches) to accommodate handplane irons and long enough (8-inches) to give a descent stroke. 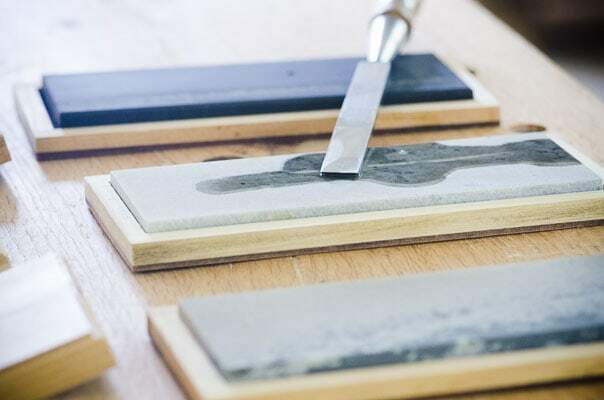 Natural oil sharpening stones wear down much slower than the synthetic waterstones, so a thinner stone like these (1/2-inch thick) will still last you for many years. And you also won’t have to flatten these stones after each use, like you should with waterstones. Regarding Arkansas stones, the manufacture told me, “You can do about 20 times more sharpening before flattening compared to Norton water stones, about 15 times more compared to Shapton and 30 times more than water stones from China.” And he also sells Norton water stones. For about two years I used sandpaper strips to flatten my waterstones. So frustrating. I burned through a ton of sandpaper and the grit continually gummed up the sandpaper. I got so frustrated that I finally broke down and purchased the fairly expensive DMT DIA-FLAT Lapping Plate (purchased here) for around $165. Being a frugal guy, this shows the great benefit of this tool. Now I can quickly and easily lap my waterstones and oil stones flat, which is vital for properly sharpened chisels and hand planes. My neighbor recently told me that he used to lap his waterstones on cinderblocks. I’m not recommending or dismissing this method, but I’m intrigued to see how well it would work. I think I’ll try it out on a cheap stone first. 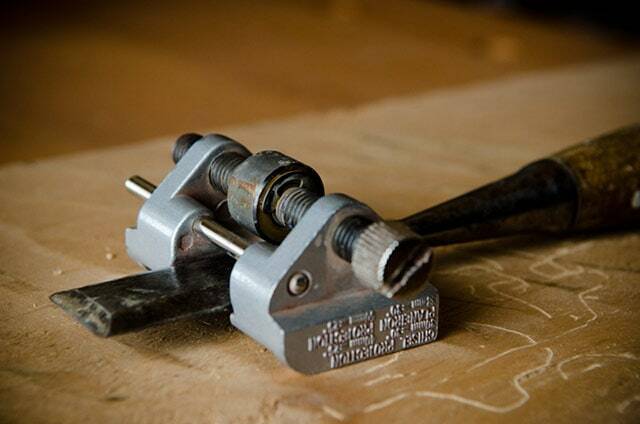 Honing guides are used to hold chisels and handplane irons at a consistent angle for honing. I have moved to honing mostly freehand (because it’s faster) but this simple and inexpensive ($10-$20) honing guide can really help beginners. Many professionals use them too, especially those who add a micro-bevel to their edge tools (I no longer use use the micro-bevel method). I recommend that beginners start out using a honing guide. 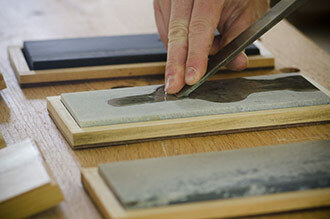 See my sharpening page for tutorials. I purchased this Robert Larson Honing Guide and it has worked just fine for several years. Even higher end tool companies like Lie-nielsen only carry a $15 honing guide, so this one is fine. A lot of people like this Veritas MK II Honing Guide, but at $70 I’ve never felt the need to try it. 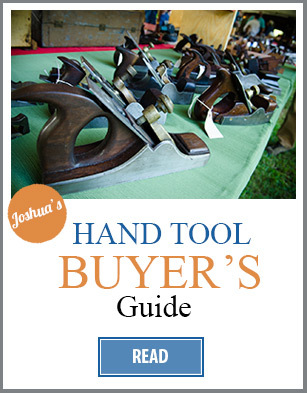 This Sharpening buying guide continues on the next page….